Just two days before training camp, the Vikings signed an intriguing prospect, with an even better name. Daniel House saw him play in the Big Ten and provided analysis of the move. Updated: July 21, 2017, 2:45 p.m. The Vikings made a roster move just two days before rookies report to training camp. The team signed defensive tackle Chunky Clements and waived defensive end Caleb Kidder. Clements, an Illinois product, went undrafted this spring and adds another intriguing prospect to the interior defensive line group. As a senior, he was very active, tallying 36 tackles (7 for loss) and 3.5 sacks. He slid off of draft boards because of a misdemeanor battery charge for a fight on campus. Clements was involved in the pre-draft process with the Vikings, so this issue has presumably been addressed. 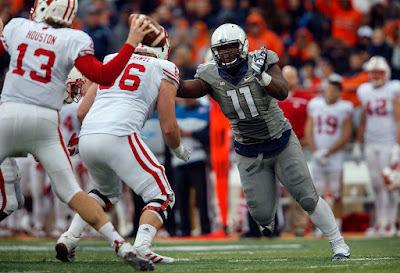 During his time in the Big Ten, I watched Clements play on numerous occasions for my college football writing. In his role with Illinois, he was an effective rusher at the three-technique, which was his primary alignment. At 6-foot-2, 301 pounds, Clements isn't a large body inside, but he wins with his quickness and active hands. His size disadvantage forced him to play three-technique, but he was extremely effective in this role. I watched him live once and consistently on tape throughout the season. Clements had trouble taking on double teams and was knocked off balance on a consistent basis. However, in the games I saw against Minnesota, he notched two tackles for loss, a forced fumble, and numerous quarterback pressures. I had him listed in my notes as a potential NFL prospect. Clement's technique was inconsistent, but he managed to get inside pressure when he stayed low and squared up inside the gap. He had a tendency to play too aggressive/tall, which jeopardized his balance and abilities against the run. Clements was sometimes exploited because of those overall balance issues. He has a few developed pass rushing moves, but really relies on his quick first step and a swim move. Nonetheless, he uses his hands very well and it helps him overcome some of the power deficiencies in his skill-set. When he can't get to the quarterback, he gets his hands into passing lanes, too. Ultimately, I worry about how he'll be able to transition to the NFL because he may be unable to handle the power of interior offensive lineman at the next level. He will need to tighten up his footwork and become more of a finesse player. His overall skill-set and body frame remind me of a less powerful version of Tom Johnson. Clements won't provide much value as a run defender, but he has impressive speed to chase down plays up the field. He can come into games on third down and play inside as a rusher. The Vikings could get creative with how they use him because of his quickness. Offensive lineman have trouble handling his burst off the snap, but he'll need to show NFL physicality isn't too much for him. However, he has a knack for creating plays and tackles for loss, which adds value to a Vikings' defensive line with plenty of young talent.